Sorry for not posting all week, both my wife, my eldest and I have been poorly this week. It's been a bit rubbish really but we're all better now and I'm playing catch up with all my jobs. The first thing I wanted to do this weekend was to get the sheep in as a big new flock for the first time. 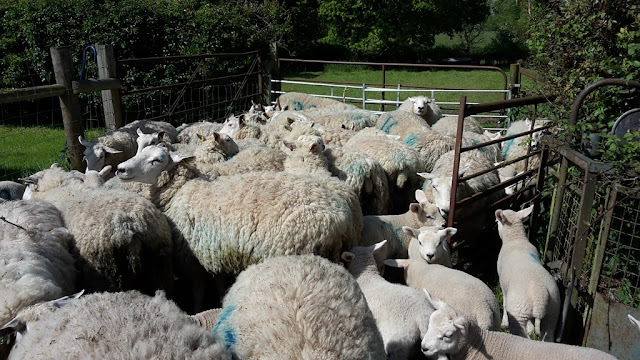 I had seen that one sheep was scouring (got the runs) and with how warm it's been I was worried about fly strike. 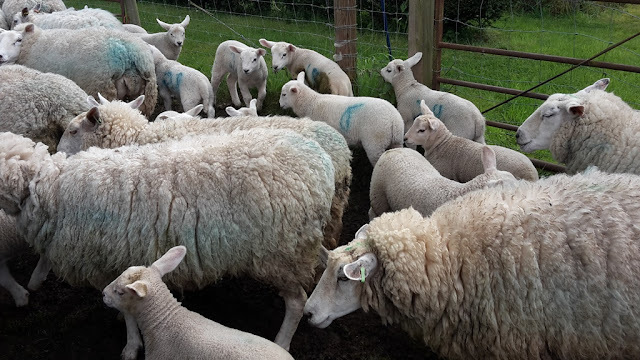 I decided that as they were all to be moved to fresh pasture I was going to worm all the ewes, penned up tight it doesn't take long, but it easier if you have someone marking them for you when you're drenching (I didn't, won;t be long until the girls are old enough). I also inspected a few feet and had a look at the lambs. I'm really pleased with this years batch, all the lambs seem healthy and happy, nearly all are a good size and in good condition. The last sheep lambed yesterday in fact, keeping me guessing as by my dates the last one should have been no later than the 5th of May! I always feel better when I'm up to date on my jobs with the stock, I feel that other jobs can wait but their welfare is the most important. Normally I won't have breakfast until I've been round them in the morning. Even when I was ill in the week I still got up and checked them all as well as feeding them each night, with a runny tummy this isn't as easy as it sounds! I'll give some garden updates next, it's growing like crazy at the moment! Glad you are all better. Love your blog and reading about your homestead and family. Blessings!! So sorry to hear you have all been ill but glad you are better now. It is so interesting reading and learning all about your Homestead. Glad you're feeling better, we've been a litle out of sorts here this week too. Beautiful sheep! Looking after any animals is taxing to a certain extent. Putting them first is essential, and I'm pleased to see that you make that very clear. I try to emphasise it too.